Inexpensive, roomy holds more than just boots -fit gloves, goggles as well.Boot Bag WSD Ski Boot Bag for 1 Pair of Ski Boots or Snowboard Boots and gear such gloves,hat,goggles,Great deal bag .For the money You can't beat these bag,Durable water resistant 600 Dernier Polyester material,Get your boots, and other ski essentials to and from the mountain for years to come with WSD Ski Boot Bag. The perfect bag for the activities you do,, Great for ski boots ,snowboard boots ,gloves,hat,mask,600D Fabric: This heavy duty nylon resists wear and tear, s Bag , Waterproof lining: A waterproof lining keeps the water and grime from ruining the rest of the bag, Boot Bag has double stitched ., stress points. Reinforced Padded Handles.Heavy Duty Zipper : The zipper is the most important feature on a bag, we have made sure that this zipper is very strong and durable to help avoid problems down the line. 600D Fabric: This heavy duty nylon resists wear and tear, and reduces the risk that sharp edges will cut through the fabric. It is also water resistant, to keep gear dry when inside. Waterproof lining: A waterproof lining keeps the water and grime from ruining the rest of the bag, Inexpensive, roomy holds more than just boots For the money You can't beat these bag,Durable water resistant 600 Dernier Polyester material,Get your boots, and other ski essentials to and from the mountain for years to come with WSD Ski Boot Bag. 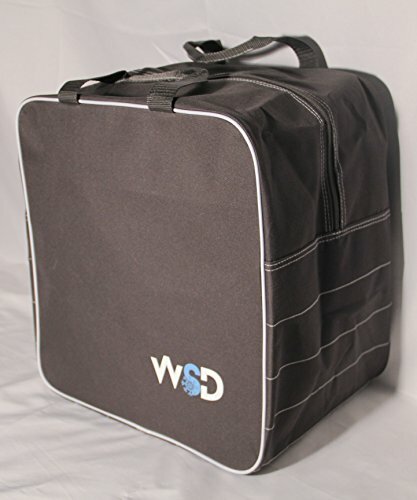 The perfect bag for the activities you do, 600D polyester PVC backing,Single Black Ski or Snowboard Boots Bag Durable water resistant 600 Dernier Polyester material,Get your boots, and other ski essentials to and from the mountain for years to come with WSD Ski Boot Bag. If you have any questions about this product by WSD, contact us by completing and submitting the form below. If you are looking for a specif part number, please include it with your message.